A nutritional mother lode, potatoes are easy to grow as long as they have full sun, moderate temperatures, and light, rich, acidic, well-drained soil. Try varieties with colors, shapes and flavors you won't find in the supermarket. Requires at least 6 hours of sun each day. Prefers well-drained, light, deep, loose soil, high in organic matter. Unlike most vegetables, potatoes perform best in acid soil with pH 4.8 - 5.5. (Scab is less of a problem at low pH. If pH is more than 6.0, use scab-resistant varieties.) Needs plentiful, consistent moisture. outdoor containers - Sometimes grown in barrels or stacks of old tires filled with compost. An herbaceous perennial grown as an annual in areas that receive frost. Late spring frosts can damage foliage, but growth will usually rebound quickly from underground parts. Growing is easy if you have the right site and soil. Pests aren't usually as bad in garden settings as in commercial fields. Fun to grow with kids, especially if you use the deep mulching method. not native to North America - Native to the Andes Mountains in South America. Propagate by division or separation - Grown from seed potatoes -- tubers grown the previous season. Germination temperature: 40 F - Do not plant seed potatoes until soil reaches 40 F.
Days to emergence: 14 to 28 - Sprouts from seed potatoes should emerge in 2 to 4 weeks depending on soil temperature. Potatoes perform best in areas where summers are cool (65 F to 70 F), but are widely adapted. Potatoes require well-drained soil. (They will rot under prolonged cold, wet conditions.) If your soil is poorly drained or a heavy clay, consider using raised beds. Adding organic matter (compost, cover crops, well-rotted manure or leaves) is a good way to improve soil before growing potatoes. Go easy on organic matter sources high in nitrogen (such as manure) and nitrogen fertilizer as too much nitrogen can encourage lush foliage at the expense of tuber production. Unlike most vegetables, potatoes perform best in acid soil with pH 4.8 - 5.5. Use scab-resistant varieties with pH above 6.0. Because most other garden vegetables perform best at near-neutral pH, it’s usually not feasible to grow potatoes in their preferred pH range, unless you dedicate one section of your garden to growing just potatoes in rotation with cover crops. Buy certified disease-free seed potatoes from garden centers or through online or mail-order catalogs for best results. If you save your own seed potatoes, discard any that show any signs of disease. Avoid planting potatoes from the supermarket because they may have been treated with sprout inhibitors. They may also be less vigorous and more prone to disease. Cut seed potatoes that are larger than a chicken egg into pieces about 1 inch across or slightly larger. Each piece should have at least one “eye” (the bud where the stem will grow from) -- preferably two eyes. 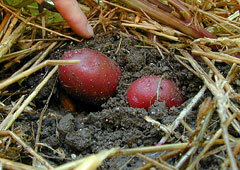 Egg-sized and smaller tubers can be planted whole. A less risky practice is to put about 5 pounds of cut potatoes into a large grocery bag and fold the top closed. Keep the bag at room temperature for 2 or 3 days, then shake the bag to unstick pieces that may have stuck together. Let sit for another 2 to 3 days and then plant. If you want fast emergence, keep the bag of cut potatoes at room temperature until sprouts appear. Some varieties are slow to break dormancy and benefit from a 2- to 4-week “pre-warming” before planting. Others sprout in just a few days. Plant about 2 to 4 weeks before your last frost date. The soil temperature should be at least 40 F. Do not plant where you've grown potatoes, tomatoes, peppers or eggplant in the past 2 years. One common way to plant potatoes is to dig a shallow trench about 4 inches deep with a hoe. Place the seed potato pieces with their eyes up (cut sides down) about 8 to 12 inches apart in the trench, and replace soil. Space trenches about 2 to 3 feet apart. Stems and foliage should emerge in about 2 to 4 weeks, depending on soil temperature. Alternatively, snuggle seed pieces shallowly into the soil and cover with a thick layer of clean straw or other weed-free mulch. Add more mulch as needed to keep light from reaching potatoes. (A foot or more of mulch may be required.) Tubers grown this way can be easily harvested by pulling back the mulch after the plants die. A third method if you have excellent potato-growing soil is to plant seed potatoes 7 to 8 inches deep and skip hilling or deep mulching. 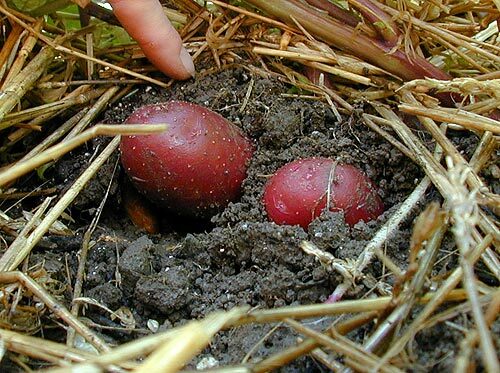 The potatoes are slower to emerge, but this method requires less effort during the growing season. Deep planting is not good in cold, damp soils and it requires more work to dig the potatoes at harvest. Potatoes need at least 1 inch of water per week from either rainfall or deep watering. Mulching helps retain moisture. Keeping the soil from drying out also helps reduce scab. Use row covers to protect from Colorado potato beetles, leaf hoppers and flea beetles. Crush the yellow eggs of Colorado potato beetles on the undersides of leaves. Remove adults by hand. Colorado potato beetles - Hand pick beetles, eggs and larvae. Flea beetles - Use row covers to help protect plants from early damage. Put in place at planting and remove before temperatures get too hot. Control weeds. Wash small nymphs off with a hard stream of water. Early blight and Late blight - Use certified seed. Avoid wetting plant foliage if possible. Water early in the day so abovegrounds plant parts will dry as quickly as possible. Avoid crowding plants. Space apart to allow air circulation. Eliminate weeds around plants and garden area to improve air circulation. In autumn, rake and dispose of all fallen or diseased leaves and tubers. Locate new plants in a part of the garden different from previous year's location. Resistant or moderately resistant varieties include Allegany, Elba, Rosa and Sebago. The fungus that causes late blight has recently become a major threat to home gardens and commercial growers because of the migration of new strains (genotypes) into the United States. The disease can readily spread from home gardens to commercial fields. Verification of a late blight diagnosis and implementation of prompt control measures are highly recommended. The newly arrived strains are more aggressive than previous strains. Cultural control measures such as those listed above may not adequately control these new strains. Scab - Use certified seed. Locate new plants in a part of the garden different from previous year's location. Lower soil pH to 5.2 with sulfur. Plant resistant varieties: Chieftan, Norland, Russet Burbank, Russet Rural and Superior. Viral diseases - Use certified seed. Control aphids. Sweet potatoes require warmer temperatures and a longer season. Browse potato varieties at our Vegetable Varieties for Gardeners website. Season: Spread out your harvest by choosing early (ready to harvest in about 65 days), mid-season (80 days) and late (more than 90 days) varieties. Skin and flesh colors: Range from purple, red, pink, gold and yellow, in addition to the usual white. Potato varieties have a range of subtle flavors, too. Size: From huge baking potatoes to tiny fingerlings that bake or microwave quickly. Also look for scab-resistant varieties if soil pH is greater than 6.0.